Residents with their belongings in the Somali capital Mogadishu on July 19 after a fresh drive by insurgents. (CNN) -- More U.N. personnel will be sent to war-ravaged Somalia after years of low staff levels in the troubled nation, a top official said Tuesday. Augustine P. Mahiga, the special envoy to Somalia for Secretary-General Ban Ki-moon, said he expects the increased presence will help calm violence in the Horn of Africa country. The U.N. Political Office for Somalia will beef up international and local staff in the semi-autonomous regions of Somaliland and Puntland, in Somalia's northern areas. But personnel are still essentially off limits to the anarchic seaside capital, Mogadishu. That insecurity was on display Tuesday in Mogadishu. 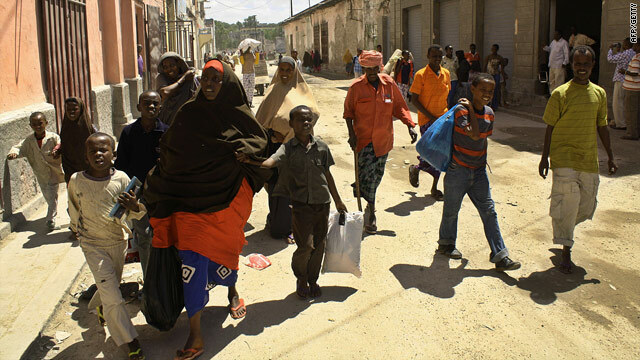 Residents were shopping for Ramadan in the capital city's largest market, Bakara, when fighting broke out between Hizbul-Islam insurgents and the Somali government backed by the African Union peacekeeping mission in Somalia (AMISOM). At least 10 people died and 27 were wounded, according to Ali Muse, an ambulance director. There was no reaction from representatives of either of the parties involved in the fighting. Earlier, fighters with Al-Shabaab -- the Islamist militant group battling Somalia's U.N.-backed transitional government -- had vowed to speed up fighting during Ramadan, a month of sunrise to sunset fasting for Muslims. The United Nations has more than 60 international staff and nearly 800 national staff based in Somalia. In recent years, U.N. personnel have suffered murders and kidnappings in Somalia, widely considered to be one of the most dangerous countries in the world for aid workers to operate. Over the past 17 years, U.N. personnel assigned to Somalia have been based in Nairobi, Kenya's capital, because of the insecurity. Southern Somalia is the worst part of the country in terms of security. Chronic warfare has plagued the region since 1991, when the government of Mohamed Siad Barre was overthrown. Most of the country's most vulnerable people are in the south, according to Mahiga's statement. Further, the U.N. Support Office for AMISOM has maintained an ongoing presence in Mogadishu to support the 6,100 African peacekeeping troops based there. "The U.N. works hard to be as close to those suffering the effects of the conflict as possible," Mahiga concluded in the statement. Somalia was ranked in 2010 as the worst failed state in the world, according to Foreign Policy magazine's annual index of such nations. Chad and Sudan, respectively, round out the top three failed states.